Dutch Ovens have a long tradition in several countries dating back to the 18th century. Whereas Australians call them Camp Oven, French people use a Cocotte, Britons a Casserole Dish. In South Africa, Dutch Ovens are known as Potje, in Baltic countries as Sac. What all cultures mean is the same thing: A Dutch Oven is a pot with three stands and is made of durable cast iron. That is why you can use the pot for roasting and baking in the naked flame. Petromax is probably the best-known High-Pressure lantern in the world. To widen the portfolio, Petromax introduced the original Petromax Dutch Ovens in four different sizes. Perfect for preparing your food over an open fire and in the kitchen, it allows you to enjoy cooking in a whole new way. 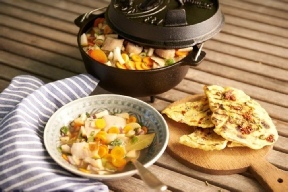 Please, try vegetables, meat, hotpot, bread or fish prepared in your Petromax Dutch Oven. In fact, the cooking guarantees a perfect taste as the Dutch Oven stands in the fire. The Petromax Dutch Oven further features a specially designed lid that can be used as a skillet or a platter. 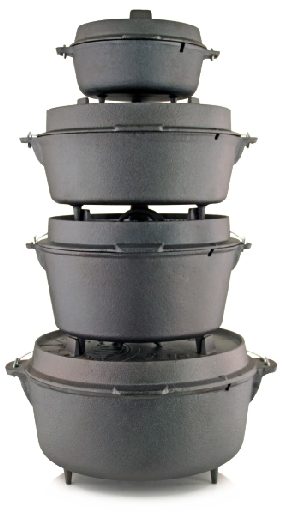 This lid also helps you to regulate the heat: You can place the hot coals on the top of it to regulate the heat. Moreover, you can use the Dutch Oven at home. Therefore, place it in your oven for preparing delicate roast. The temperature slot helps you to test the heat in the closed Dutch Oven. All in all, the special inner surface guarantees an optimal heat to help you cooking delicious meals. Thanks to its pre-seasoned finish you can test your Dutch Oven as soon as you got it. The cast iron does not have to be treated in a special way before the first use. Even well-known cooks love the Petromax Dutch Ovens. Peter Niemann is the manager of the Slow Food Verband Sachsen (Slow Food Union of Saxony) and is convinced by the quality of the food being cooked in the Petromax Dutch Oven. 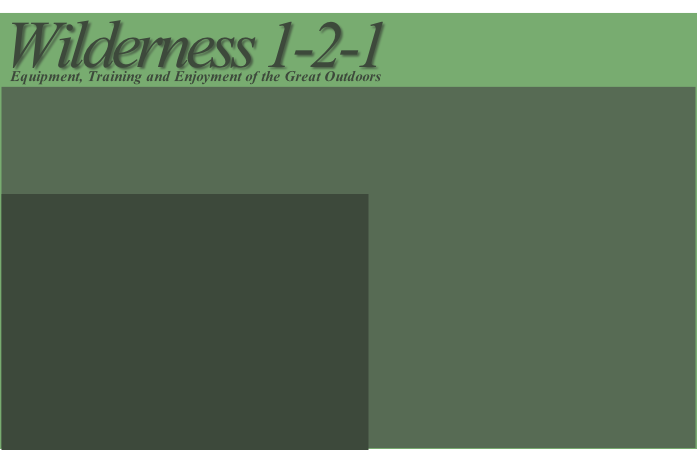 He exclusively developed recipes of thyme-focaccia, Starnberger Renken-Eintopf (a special hotpot) and Rib Eye Steak with Pinot Noir which can easily be cooked whilst a camping on a campfire. Besides, you can use the Petromax Dutch Oven to smoke fish or meat. Place your favored food, together with a tablespoon of smoking splinters and your favorite spice in the closed Dutch Oven at mean heat to give your food that special flavour. Enjoy your meal! A truly unique taste of food thanks to the specific heat transfer around the Dutch oven food (bread, meat, vegetables) is cooked very gently to preserve nutrients and vitamins perfect for travel, vacation, camping and outdoor activities specially designed lid that can be used as a skillet or a platter pre-seasoned surface so you can place it straight in the fire and start cooking optimal heat transfer thanks to its specific surface structure easy temperature reading without having to lift the lid notched carry handle ensures safe and comfortable handling highest Petromax product quality.